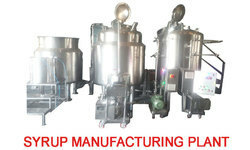 Leading Manufacturer of zero hold up filter press, colloid mill, liquid manufacturing plant, inline homogenizer and syrup making machine from Mumbai. Diameter 8" / 14" / 18" / 24" / 33"
Zero Hold-Up / Sparkler Type Filter Press consist of Stainless Steel Shell Top cover using bolts to give pressure tight enclosure. 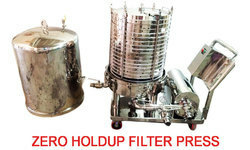 The filter cartridge assembly inside the shell consists of several horizontally arranged disc type filter plates with perforated supporting screens, filter media interlocking cups. The entire assembly complete with pump piping connection is mounted on a suitable S.S. Trolley. Single pass filtration with no solid bypass. Plate pack arrangement ensures any type of filtering media singularly or in combination, can be used to achieve required micron efficiency. Easy removal and cleaning of the cartridge assembly. Closed System ensures filtration of toxic, hazardous, explosive materials, efficiently cleaned and sterilized. Central feeding ensures no solid inside the vessel, complete recovery of liquids. Available model 8", 14" , 18", 24" 33". Versatile compact cGMP colloid mill suitable for Homogenizing, dispersing, mixing, communicating more rapidly and emulsifying to give best results with an extremely high quality. The unit consists of stainless steel conical hopper, three way valve for drainage and recirculation, outlet nozzle and sprout rotor and stator assembly with 5H.P./ 3 HP motor, DOL starter with overload relay and optional jacket for cooling or heating. Circular ring shaped internally conical stator stator having two different tooth stages, for higher accuracy. Toothed conical rotor is coupled with belt in vertical deluxe model. Water Jacketed Hopper are as standard feature. Capacity up to 10,000 liters. Sterilizing In Place - SIP as an Option. Complete process of dispersing, high shearing, emulsifying and homogenizing. Cooling system for the mechanical seal for long high shear mixing time. All contact parts are made out of SS 316L/SS 316 and SS 304. 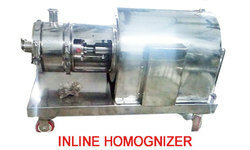 The specification of the inline continuous mixer complies with cGMP regulation. Tri-clover connections provided for easy operating and maintenance purpose. Looking for Liquid Oral Manufacturing Unit ?